Years from now, people will look back on 2013 as a historic time for gearheads. It was the year of the sports car. Among the machines unleashed on our roads: the all-new seventh-generation Corvette, the first new Jaguar two-seat sports car in more than 50 years, a new Euro-styled Viper, a slick 12-cylinder Aston Martin, two Porsches (including the German firm's first-ever hybrid supercar) and a pair of seven-figure hybrid Batmobiles from Ferrari and McLaren, each thumping well over 900 horsepower. Even if you're not in the market for one of these rolling monuments to testosterone, there's still something cool and cutting-edge for you out there. To suss out the best of the best in every category, we prowled the earth's byways, from twisty roads in China to hilly thoroughfares in the south of France to the clogged intersections of Los Angeles and Chicago. Now, we'll let you know what made the cut. All week we'll be rolling out our annual pick of the top new automobiles, starting today with the best sports cars. For the seventh (since its debut in 1953) generation of Corvette, Chevy engineers had their work cut out for them. Against a tide of declining sales, how could they convince 20- and 30-somethings that their dad's idea of a cool car should be theirs too? 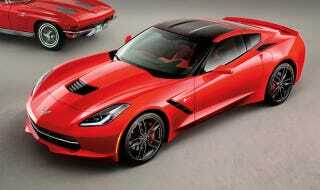 Chevrolet promised the most performance and mileage out of this new base Stingray, and the company delivered. And the styling? Nuanced yet true to the DNA. All told, this is an unbelievable amount of car for the money. We test-drove it all over California, Illinois and Virginia. People jumped off curbs to snap phone pictures; it's that striking. Specs include a hydro-formed aluminum frame, carbon-fiber panels, a crisp seven-speed manual and a torque-rich V8 with 460 horsepower. Add the Z51 track package and you're unstoppable. And Chevy finally listened to the critics and seriously upgraded the interior. Bottom line: the best Vette ever. Priced less than a comparable Ferrari, the 565-horsepower Vantage S delivers a blazing 3.7-second sprint to 60 mph and a 205 mph top speed. With new electronically controlled suspension, it tackles corners like a sure-footed athlete. And it's an Aston, so it's fantastically beautiful in that 007, just-understated-enough style. Slap some Union Jack livery on this six-liter two-seater and you're licensed to kill. They don't call it a Dodge anymore. After Fiat bought Chrysler, the Detroit firm released a new iteration of its legendary brute under the SRT (Street & Racing Technology) badge. The Italians gave the styling some love inside and out. While the car now has traction control, it's still a 640-horsepower, 8.4-liter V10 beast. Driving it is like getting in the ring with Mike Tyson—in a good way. Ice packs not included. Don't call it a junior 911. The mid-engine, 275-horsepower Cayman is a car all its own, and it's the best all-around performer for its price in the Stuttgart lineup. During our test drive we adored its neutral road manners, refined agility and deft throttle punch delivered by a 2.7-liter flat six with a glorious song. Naturally, the S model is the car you want (50 more thoroughbreds) if you have the extra $11,000. Check back Tuesday, when we unveil our 2014 Sedan of the Year.